Right Brainers with Left Brain Tendencies. Essentially, we're a group of strategically-minded creatives. People who couple analytical thinking with outside-the-box imagination to achieve a singular goal: grow your business. As much as design work needs to look good, it also needs to be effective. We adhere to this maxim on every project because we wouldn't expect you to use our services if they didn't increase your bottom line. Our signature Brand Protocol was designed to marry strategy and creativity. It's an exclusive methodology we use to solve brand problems. Every project we take on is broken into three steps: Define the Problem, Navigate the Action, Achieve Results. These steps help make our job clear and our goals apparent so we can better reach your sales targets. Once we define the objectives, we get to work designing logos, website design, print ads...everything you need to communicate who you are to the consumer. We believe in collaboration and always welcome ideas from our clients. After all, you know your business. Lastly, we'll deliver your brand to the world like a present with a big red bow. Now that's something everyone wants to open. So hop on board our brand bus. You'll find it's cozy, fun and big enough to take you places. 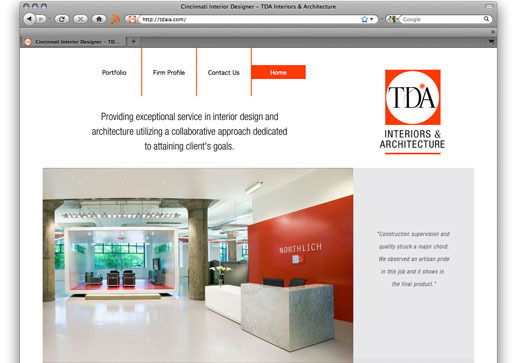 TDA Interiors & Architecture is a talented group of interior designers and architects who needed help re-branding. Their logo and website were cluttered, cumbersome and showing their age. Aranzamendez Design looked to strategically brand TDA and redesign their identity and website, making their brand look as good as their work does. We gave them a simple, clean logo that clearly represents the company. Similarly, their new web site is easy to navigate, organized and accentuates the firm’s past work.